The rapidly disappearing wetlands that once spread so abundantly across the American continent serve an essential and irreplaceable ecological function. Yet for centuries, Americans have viewed them with disdain. Beginning with the first European settlers, we have thought of them as sinkholes of disease and death, as landscapes that were worse than useless unless they could be drained, filled, paved or otherwise "improved." As neither dry land, which can be owned and controlled by individuals, nor bodies of water, which are considered a public resource, wetlands have in recent years been at the center of controversy over issues of environmental protection and property rights. The confusion and contention that surround wetland issues today are the products of a long and convoluted history. In Discovering the Unknown Landscape, Anne Vileisis presents a fascinating look at that history, exploring how Americans have thought about and used wetlands from Colonial times through the present day. She discusses the many factors that influence patterns of land use -- ideology, economics, law, perception, art -- and examines the complicated interactions among those factors that have resulted in our contemporary landscape. As well as chronicling the march of destruction, she considers our seemingly contradictory tradition of appreciating wetlands: artistic and literary representations, conservation during the Progressive Era, and recent legislation aimed at slowing or stopping losses. Discovering the Unknown Landscape is an intriguing synthesis of social and environmental history, and a valuable examination of how cultural attitudes shape the physical world that surrounds us. It provides important context to current debates, and clearly illustrates the stark contrast between centuries of beliefs and policies and recent attempts to turn those longstanding beliefs and policies around. Vileisis's clear and engaging prose provides a new and compelling understanding of modern-day environmental conflicts. "…a major addition to the literature of American environmental history." Roderick Nash, author of "Wilderness and the American Mind"
"Though I have focused my entire professional career on wetlands, this book provided me with new information, insight, and appreciation of our wetlands resource. 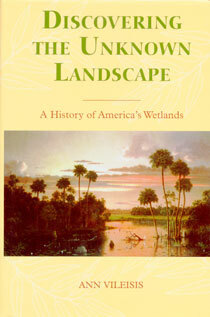 There is no student of wetlands that cannot benefit from reading this book." "Vileisis gives us the cultural history of America's wetlands in intricate detail, from Henry David Thoreau, neck deep in a cranberry bog, gaining 'a sense of the richness of life,' to senators' jockeys over the Swamp Land Act in 1849." " …a fine survey of changing American attitudes towards wetlands, and of the struggles that have been fought for their protection. It will become a standard work on its subject." William Cronon, University of Wisconsin, author of "Nature's Metropolis"
"A rare book that goes beyond description to contribute to our understanding of the land and of American culture." "A simply first-rate piece of environmental history—comprehensive and careful in its research, well reasoned in its analysis, and exceptionally well-written. Vileisis has provided a model as to how environmental history can markedly enhance how we understand the environmental present and how we think about the future." "In this timely, well-documented work, environmental historian Vileisis explains the confusion and contention surrounding wetlands preservation in terms of the differing cultural values Americans have historically assigned to these problematic habitats. . . . From salt marshes of Colonial New England to the recent efforts to restore the Florida Everglades, Vileisis discusses not only the changes in common practices, laws, and regulations but also the shifts in cultural and social attitudes. Highly recommended. . . . "
Discovering the Unknown Landscape co-won the 1999 American Society for Environmental History's George Perkins Marsh Prize.